Exams are stressful. We get it. If you’re you feeling overwhelmed or nervous, try not to panic, help is at hand! 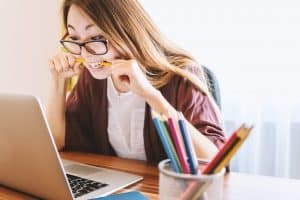 In this article we’re going to go cover 7 Revision strategies you can implement to increase your exam confidence, performance and hopefully your results. This sounds obvious, but being clear about key objectives means you can focus on necessary information and not waste time on irrelevant content. Ask your lecturers if they can supply you with specific syllabus details so you can then create a concise revision plan. Last minute cramming is not effective and can be extremely stressful. Many exam failures are due to lack of preparation and planning. Make a timetable as detailed as possible, taking into account when your exams are and targets for each day. Be realistic with your timetable, add plan plenty of rest/refreshment breaks. Scientific research indicates that having regular breaks means you have a higher chance of retaining relevant information. Check out the Pomodoro Method described in more detail in a previous blog post, adapt it to your needs. Be sure to check with your tutors anything you don’t understand or are unclear about. Practising past papers will get you used to the exam format, timings and give you some indication of how thoroughly you know your subject, as well as areas you need to improve. Remember, the purpose of revision is partly to identify the things you don’t know well! Time yourself and plan your work as though performing under exam conditions. Although you cannot predict questions based on previous exam papers, examiners do re-use or re-word questions and there is a limit to the number/combination of questions that can be asked. Tutors will usually issue you with past papers and you can download them from examining board websites. Group study is not for everyone but a useful activity for some. Revising with others can make the experience more enjoyable and is a good way to share and discuss key concepts and stay on track. Allocate a different study topic to each of the group, learn thoroughly then brainstorm together, lighten the load. If you can explain a topic clearly to others it shows you have a good understanding. A word of warning, enjoy the group experience but don’t treat it as a social gathering and become too distracted! It is important to relax, everyone wants to do well but remember not every success story is based on academic achievement! Take time out, try to eat healthily, get plenty of sleep and make time for some daily exercise. Be kind to yourself and do an activity you enjoy. However, if you feel overly stressed and anxious it is important to seek further support to help you deal with this. Most universities have a Student Health Adviser, University Chaplain or Disability Team who you can speak to in confidence, they will listen and help you to decide the type of support you need. You can also check out our previous post and video on tips to relieve stress.